The Dwight H. Terry Lectureship invites preeminent scholars in religion, the sciences and philosophy to address issues concerning the ways in which science and philosophy inform religion and religion is applied to human welfare. The lectures are typically three or four in number and are usually delivered over two weeks. Established in 1905 by a gift from Dwight Harrington Terry of Bridgeport, Connecticut, it is among Yale’s most distinguished lectureships and has yielded important and enduring books, which are published by Yale University Press. A comprehensive list of lecturers since 1923 can be found here. For all inquiries related to the Terry Lectureship, please contact Andrew Forsyth, assistant secretary. Thomas E. Lovejoy ’63 B.S., ’71 Ph.D.
Thomas Lovejoy is a professor in the Department of Environmental Science and Policy at George Mason University and a senior fellow at the United Nations Foundation, based in Washington, DC. 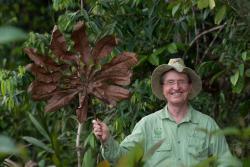 Lovejoy has served on science and environmental councils under the Reagan, Bush and Clinton administrations and was also the World Bank’s chief biodiversity advisor and lead specialist for environment for Latin America and the Caribbean. Lovejoy holds Bachelor of Science and PhD in biology from Yale University.